All persons renting boats must be at least 8 years old and have passed level 5 swimming lessons. Boat Attendants have the right to refuse boat rentals to any person(s) unable to manage a specific craft. Boats are available for rent at the boathouse daily between the hours of 11:00am and 6:00 pm with the last boat into shore at 7:00pm. Rates are posted at the boat house. All boaters, whether in Winding Trails boats or their own, must wear lifejackets. If we cannot properly fit your child in a lifejacket, they will be unable to accompany you in the boat – No Exceptions! Electric motors not to exceed 5hp are permitted on the lake. No gas motors are allowed. All boaters operating an electric engine must be registered with the State of Connecticut and have a valid Safe Boaters Certificate. Launching of boats is allowed only from the provided launch site across from the Main Office building. No inflatable boats are permitted. Boats are restricted from swimming areas. If you are transporting your boat to Dunning Lake from another lake, please be sure to wash your boat thoroughly prior to launch. This will help prevent the spread of weeds and other organisms from one lake to another. A hose is located on the side of the office building for your convenience. Boats may be stored by members on the peninsula across from the main office year-round for a fee. All boats are stored at the owner’s risk. Winding Trails accepts no responsibility for loss or damage. Only one boat can be stored at each boat slip. Stickers will be issued showing the member number and assigned boat slip. Stickers must be visibly displayed on all boats. Boats without a sticker will be removed. Registration forms for storage of canoes, rowboats and sailboats less than 15 feet are available at the Main Office. Fees must be kept up to date. Once you are notified of delinquent fees the boat will be removed from the peninsula and not released until all delinquent fees are paid. Members 16 years of age and older must have a valid fishing license. 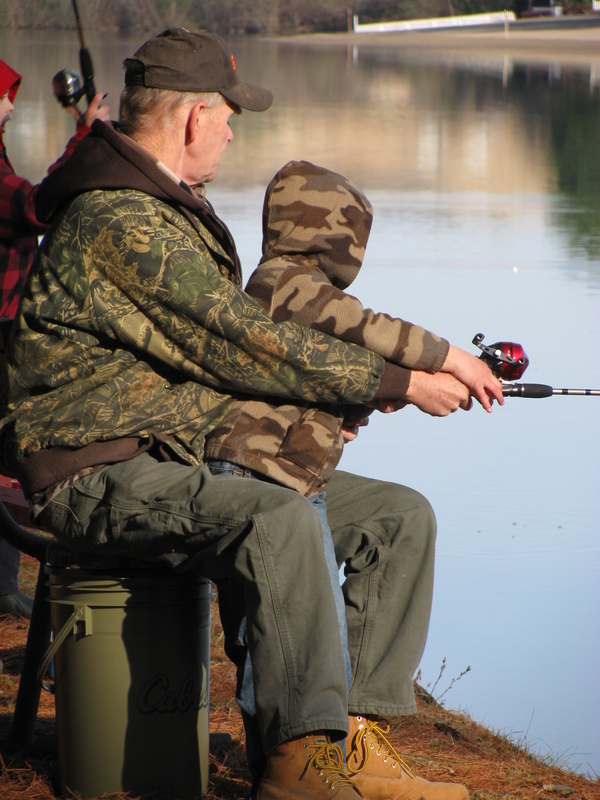 Children under 16 do not need a fishing license. Please be sure to stick to posted limits on daily catches. Anyone with more than their limit may have their privileges revoked. Over fishing only hurts all fishermen in the end. Please catch and release. Members are allowed three trout or bass per day. If you bring a guest, you and your guests cannot exceed the five trout or bass limit per day. Bass Protective Slot Limits – 12″-16″ long bass are in the protective range and must be released. Only one bass over 16″ may be kept each day.